Every time I dig through my stash of MacGyver-Reboot-related folders, I stumble over material about the Unaired MacGyver Reboot Pilot, filmed in Spring 2016. I’m trying to put all the necessary information together for interested readers – especially since many of you accidentally landed on my blog after looking for information about it by using search engines. A storyboard is a graphic representation of how film material will unfold, shot by shot. It’s made up of a number of squares with illustrations representing each shot. Think of it as sort of a comic book version of a script. The storyboard for the Unaired Pilot was created by Storyboard Artist Aaron Sowd. 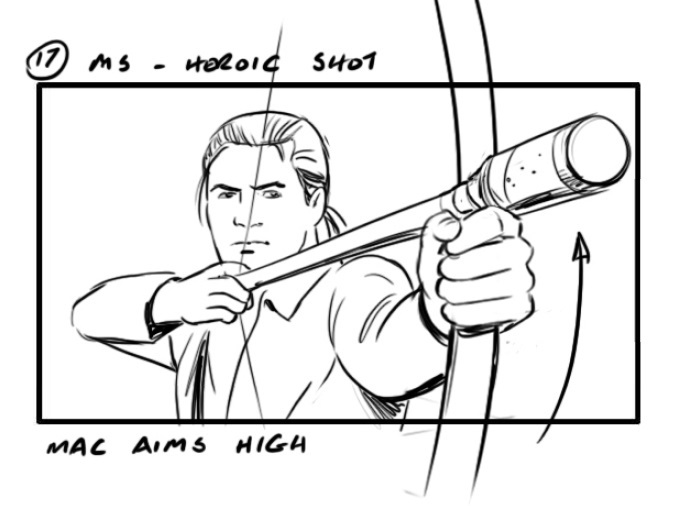 The latest storyboard post ended with MacGyver drawing his improvised bow, aiming high in direction of Keith fleeing the scene. If you think this scene feels familiar, then that’s probably because you might have seen it in the Teaser Trailer for the Unaired Pilot. In the Teaser, we see a slightly bloody-faced Lucas Till for maybe half a second doing the heroic shot. Then the camera switches to show him in profile when he lets go of the arrow. 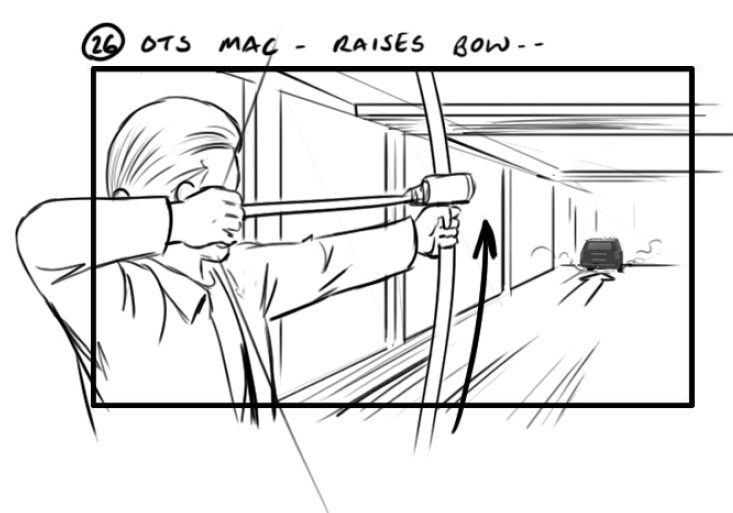 In the storyboard, we switch to Keith fleeing in his car before Mac lets go of the arrow. Aaron Sowd notes unter the drawing that Keith fumbles with his keys so Mac has time to build his contraption. I’m still not sure how this would have looked in the finished scene. I think Keith is either the slowest villain ever or he parked his car 2 miles away. Finally, Keith manages to speed off in his car. We see the getaway from different angles, and Aaron added close ups of the tires or of Keith’s foot stomping on the gas pedal. Mac finally draws his bow; shooting the arrow high and up over the 2nd floor bridge. Aaron suggests that the camera tracks and tilts to follow the trajectory of the arrow. The close-up shows the arrow landing right in front of the SUV and exploding. We also got to see that in the Teaser Trailer. The explosion lifts the car, flipping it over so it lands on the roof. The scene was filmed in an abandoned shopping mall (Hawthorne Plaza). 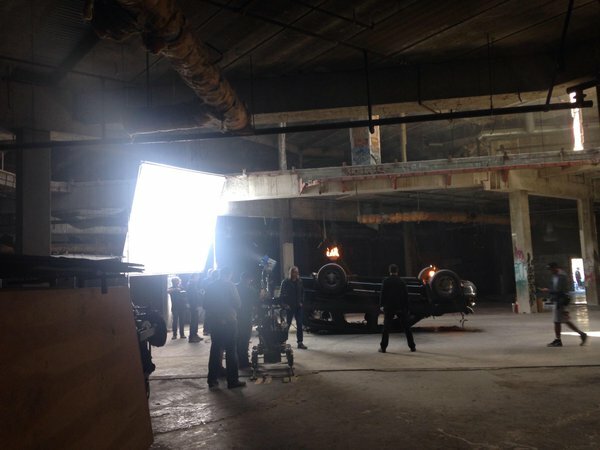 On April 4, Clint Buckner had uploaded a BtS photo that shows the flipped over vehicle. The storyboard shows the car being damaged by fire and/or smoke. 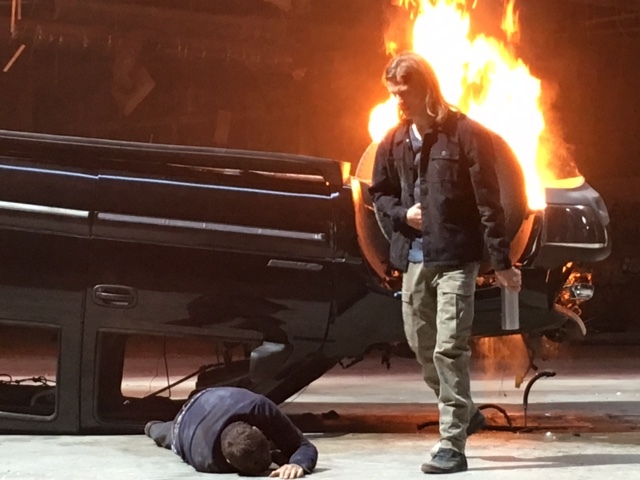 In a BtS photo by Costume Designer Eileen Cox Baker, we actually see MacGyver standing in front of the car; flames licking at the SUV. The camera pans in and we see the car door with a cracked window opening. 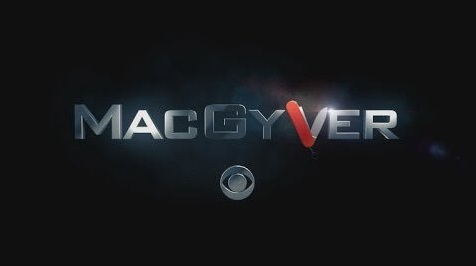 Many fans of the Original Show hadn’t been pleased by the Teaser Trailer; stating that MacGyver shouldn’t kill people – even if they are bad guys. What we didn’t see in the Teaser was that Keith is not dead, just a bit inconvenienced. We see Keith crawling out of the car while Mac approaches the scene. Keith draws his gun but of course, Mac is already there to stop him. All Mac has to do is to stomp on Keith’s hand so he gives it up, then kicking it away in true OG MacGyver fashion. In Baker’s photo, there’s no gun visible anymore, but Mac is holding the cannister. So maybe in the filmed version, Keith had been holding onto the cannister while trying to crawl away, not onto a gun. After Mac kicks the gun away, Keith mutters something about Mac’s father being proud of him. I’m assuming it was meant ironically. It’s not sure if Mac already was aware that Keith and his father know each other or if this was some kind of a plot twist reveal that would have come handy in later episodes. The camera pans in on MacGyver for another “hero shot”. I don’t know if this would have been the last scene of the pilot or if there was an after-scene with Lincoln (played by George Eads) and Mac’s friends (e.g. best friend and roommate Gunner). It’s possible that the episode would have ended similar to the reshot pilot; like the team deciding to join the clandestined organization set up by Lincoln’s sister (played by Michelle Krusiec). The storyboard for the Unaired Pilot was created by Storyboard Artist Aaron Sowd. In the excerpt from scene 49, we got to see MacGyver escaping from duct tape bindings and hunting down the bad guys (Redwood and Keith). 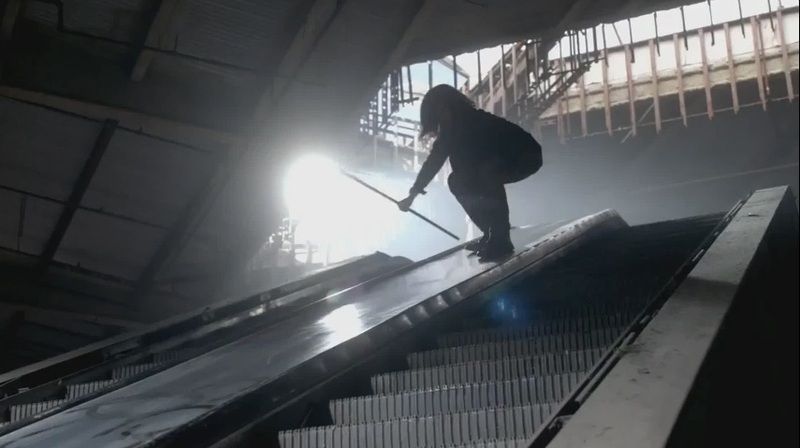 While Redwood falls over the edge after being stunned by a MacGyverism, Mac runs to the escalator to catch up with Keith. If you think this scene looks familiar, then that’s probably because you might have seen it in the Teaser Trailer for the Unaired Pilot. MacGyver slides down “between” the two escalators that are standing still since they’re not in use anymore. I’m not sure what location the villain’s dungeon was supposed to be in the original script or the storyboard, but the scene was filmed in the empty Hawthorne Plaza Shopping Mall. Aaron Sowd envisioned to show MacGyver sliding down from different perspectives. In the Teaser Trailer, we see it only from one direction, with Mac rolling over at the bottom after gaining a lot of speed. Note that in the Trailer, he’s holding unto a pipe which he isn’t holding (yet) in the storyboard. 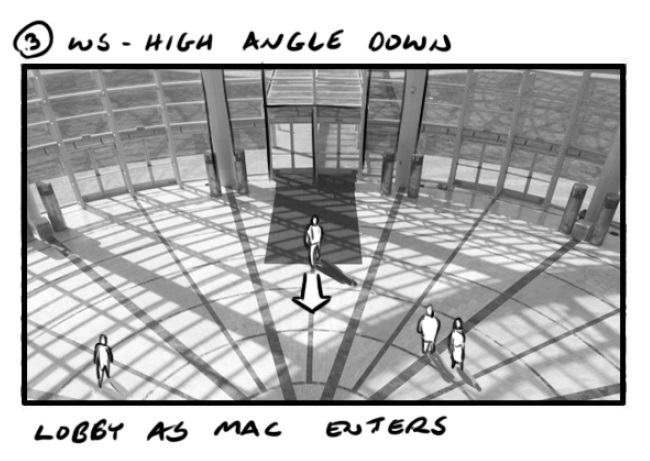 After the slide shot, the storyboard cuts to Keith running towards his car with Mac running after him. Mac then stops and hunkers down, being in pain (I’m not sure why since I don’t have the full storyboard). Mac did take a beating before, so maybe he’s holding his ribs. So he notices he still has the vial in his pocket. Perfect opportunity for another MacGyverism! Red mercury is a substance of uncertain composition purportedly used in the creation of nuclear bombs, as well as a variety of unrelated weapons systems. It is considered a hoax and the existence of such a substance has not been documented. Samples of “red mercury” obtained from arrested would-be terrorists invariably consisted of nothing more than various red dyes or powders. It has been suggested these may have been sold as part of a campaign intended to flush out potential nuclear smugglers. When Mac looks at the vial, we can see pipes in the background. As Aaron Sowd notes, the following shots could be a series of quick cuts in montage style or being intercut with Keith fleeing to heighten the tension. They can’t keep Keith running several minutes so MacGyver has enough time to build his new MacGyverism – either Keith’s car would have to be very far away, Keith is the slowest runner ever or MacGyver builds his MacGyverism within 20 seconds. I’m assuming in the finished version it was the latter and I’m pretty curious how this scene turned out on screen. They might have used a split-screen-technique similar to the one they used very often in the first Season of the Reboot. So MacGyver takes one of the PVC pipes; wrapping the wire around it on one end. Then he bends the pipe so he can wrap the other end of the wire around the other end of the pipe; building a bow. Then we see a close-up of MacGyver picking up a smaller pipe to build an arrow. Sadly, the vial doesn’t fit into or onto the smaller pipe. Mac is not amused. In fact, he’s very frustrated – until he remembers the duct tape bindings and the pieces of duct tape that he had taped onto his leg earlier for whatever reason (knowing MacGyver, maybe to avoid littering) after he had freed himself. So he duct tapes the vial on top of the smaller pipe and there goes the red mercury tip for his arrow. 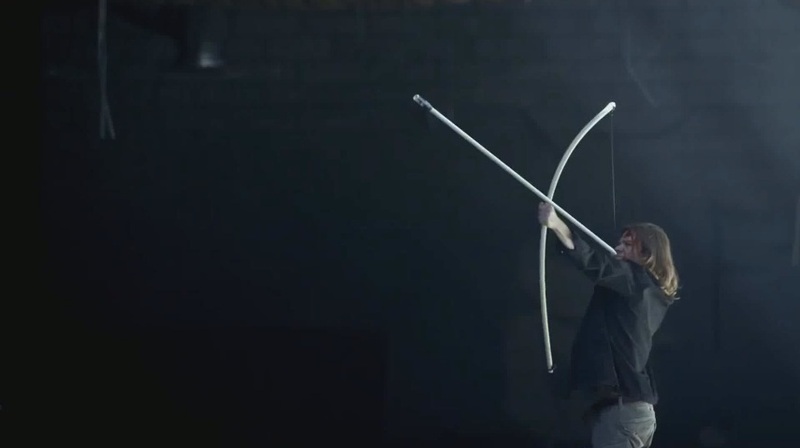 So bow and arrow ready, Mac draws the bow, ready to shoot – hopefully, Keith hasn’t fleed the building yet. I like Aaron noting “heroic shot” on the last drawing; a bit like a modern Robin Hood. Interestingly, in the Trailer, we see (a slightly bloody-faced) Lucas Till only very briefly in the heroic shot. Then the camera switches to show him in profile when he lets go of the arrow. As you can see, Mac aims high. You’ll soon find out why – in my next blog post. 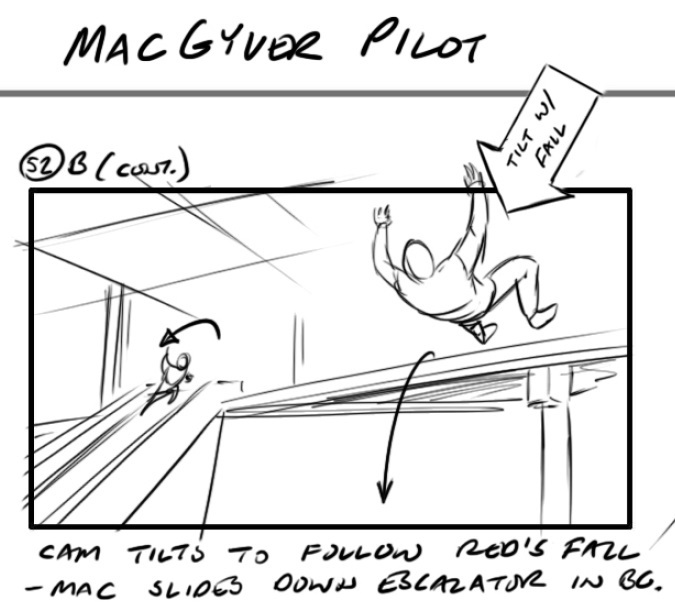 The storyboard for the Unaired Pilot was created by Storyboard Artist Aaron Sowd. In the excerpt from scenes 31-33, we got to see MacGyver scouting the Kresson building. The next Storyboard scene available is No. 49. A lot must have happened in between, because we get to see MacGyver (Lucas Till) tied to a chair and being unconscious. Apparently, he got caught, and Lincoln (George Eads) is nowhere to be seen. While Mac comes to and tries to escape the duct tape bindings, some chemist named “Jaws” is working in the same room. According to archived cast lists, Jaws was played by Torrey Vogel, who has a lot of stunt credits. Since Jaws is occupied with his vials, Mac tries to cut the bindings by snapping off a clamp on the pipe between the chair and the duct-taped wrists. As you can see, Aaron Sowd sketched the same scene twice, but with a different focus. Between his attempts of getting rid of the bindings, Mac gets punched and pistol-whipped by a bad guy named “Redwood”. Judging by the Storyboard notes, it looks like we didn’t get to meet Redwood earlier, but he might be important later. Later, some guy labelled “Kieth” (must be a spelling error) comes in, carrying a high tech cooler containing two cannisters. Without having read the script or seen the Unaired Pilot, we can assume that this is bad stuff inside those cannisters; probably a bio-weapon like in the rebooted Pilot (Episode 1×01: The Rising). In the Storyboard, we see Jaws opening the cooler and taking out a small vial from one of the cannisters. While these scenes look like they’re set in a sterile-white lab room in the Kresson building, it wasn’t as squeaky clean in the Unaired Pilot. 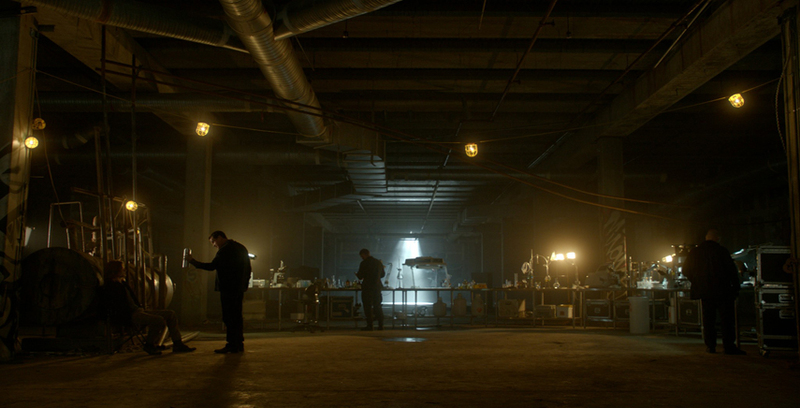 We actually have a set photo by John Mott that reveals this scene happens in some dark underground lab that is much more fitting for a bad guys lair. Of course, Mac finally manages to escape his bindings (once the bad guys have done their talking and “interrogating”. Here’s how it goes. He noticed earlier that the pipe behind him very conveniently follows along the ceiling and over the lab table. Also, the pipe is dripping and ends directly over some kind of powder that will go boom when mixed with water. So by rocking back and forward on his chair, he can move the pipe he’s tied to and get it to drip more water. All Mac has to do is to wait until the water drops onto the powder underneath so he can rip his bindings when the bad guys are distracted by the explosion. As you can see, Aaron Sowd suggests to show the fall of the waterdrops in slow-motion. The “big explosion of light” knocks Jaws out. After ripping the tape, Mac slaps the ripped tape from his wrists onto his leg, grabs the vial and puts it in his shirt pocket as he runs to the escalator. Of course, MacGyver just getting away would have been too easy. So he gets stopped by Redwood, and there is a fight scene with Mac getting kicked around from different angles. Whump galore! Mac gets kicked again and barrel-rolls into a wall of graffiti; knocking over a pile of spray paint cans and finding other things he can use for his next MacGyverism. He grabs one of the paint cans and a nail. As Redwood drags him away, Mac inserts the nail into the can, throwing it ahead like a grenade. The camera follows the arc of the can in a close up. The paint can explodes in front of Redwood, and he stumbles and falls backwards. Too bad that they weren’t on the ground floor. While Redwood falls over the edge, Mac runs to the escalator. So I guess Byebye Redwood, at least for now (because baddies always show up twice, right?). First, a short introduction into storyboards with the help of this nice article by Vyond. In short, a storyboard is a graphic representation of how your film material will unfold, shot by shot. It’s made up of a number of squares with illustrations or pictures representing each shot, with notes about what’s going on in the scene and what’s being said in the script during that shot. Think of it as sort of a comic book version of a script. Storyboarding helps directors, producers and cinematographers to visualize the scenes and find potential problems before they occur. It might have an influence on location scouting and budget planning. According to Wikipedia, the form of the storyboarding process used today was developed at Walt Disney Productions during the early 1930s. So far, I haven’t been able to find the Unaired MacGyver Pilot Script. (If you have it, feel free to share it with me *lol*.) But the available excerpts of the storyboard, along with the Teaser Trailer, should give us some pointers about the storyline. The storyboard for the Unaired Pilot was created by Storyboard Artist Aaron Sowd. He made storyboards for movie projects like “Point Break” (2015) or “Fantastic Four” (2015) and for TV shows like “Fear the Walking Dead” (19 episodes so far), “Zoo” (1 episode) or “Scorpion” (1 episode). The entry hall can be seen in the Unaired Pilot Teaser Trailer and also in one of the three Official Stills with Lucas Till. According to Jeremy Schonwald, it used to be a toy company’s headquarters and is mainly used as a filming location now. 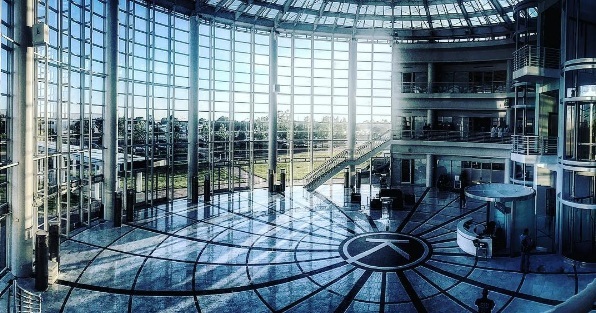 They put a “K” symbolizing the company’s logo onto the atrium floor. If you’re interested in this location (it’s a pretty impressive entry hall), you can find 171 pictures of the interior, including offices and bathrooms (and find the contact address to rent the property) here. Inside Kresson, Mac checks in to meet with Niles Cardon. We don’t have much information about Niles – but looking through the available excerpts of the storyboard, he seems to turn out as a bad guy. According to archived cast lists, Niles was played by Sunil Malhotra. As you can see, Aaron often creates the same scene twice because usually, scenes of people walking and talking are filmed several times, using different camera positions and therefore different lighting. The storyboard also helps to plan about camera positions and distances in advance. If the camera is positioned behind an actor, this means different use of lighting and the help of a Photo Double (additionally to the Stand-In), so it’s good to add it into the storyboard. Mac noticing the office supplies might be important for a later scene, so with the help of the storyboard, the director can already plan how she/he wants to highlight the items (e.g. first being blurry before getting into focus, zooming out or zooming in). 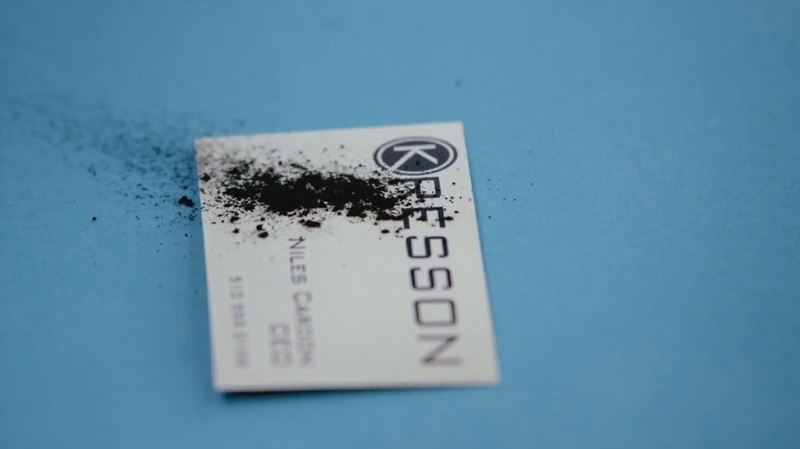 In the Teaser Trailer, we can see MacGyver and Lincoln (George Eads) lift prints off Niles’ business card to open a secure area door. So it’s possible that during the first visit, Mac mentally filed away what he could need for entering that room with Lincoln on another day. It’s most likely the camera focused on the items during Mac’s first visit long enough so that the audience would have been able to recognize the items later; imagining in advance what Mac might use them for. While some storyboard artists work with color as well, Aaron uses black and white, but highlights items or people in grey. This scene probably revealse the door to the room MacGyver wants to enter on his own. If you missed Part 1 (about the Unaired Pilot’s Origins), you can read it here. If you want to read Part 2 (about the Unaired Pilot’s promo material), you can find it there. 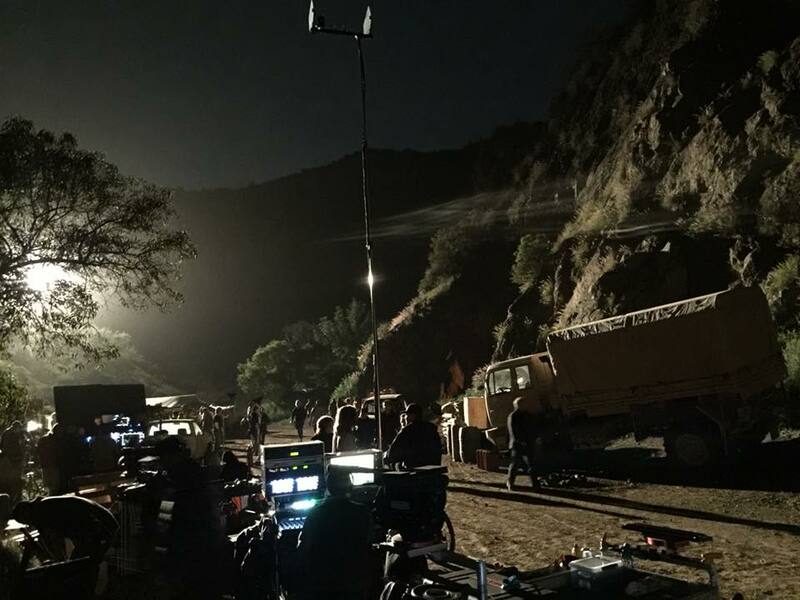 The post with the first part of BtS photos is to be found here. 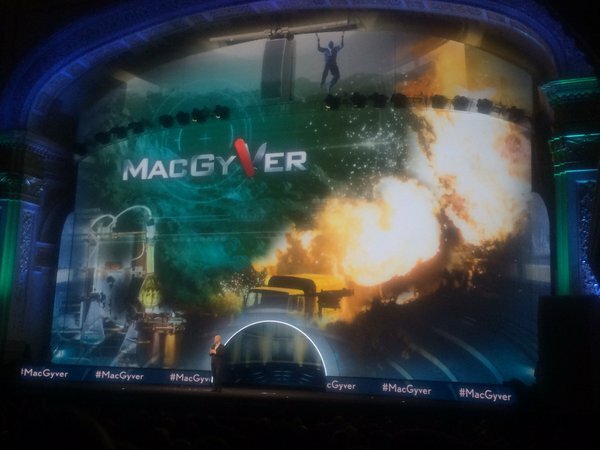 Of course, we were mostly interested in what “New MacGyver” would look like. 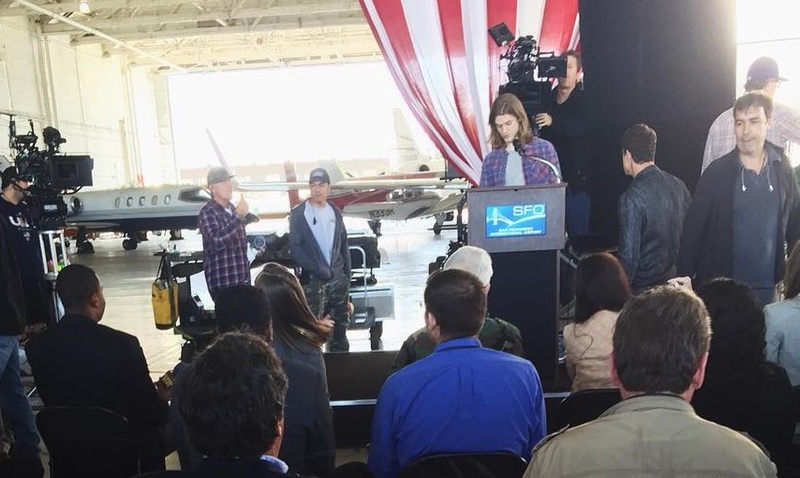 Since we knew that Lucas Till had been sporting long hair before they started filming, there were different opinions if he would (or should) wear something similar to Original MacGyver’s mullet or not. 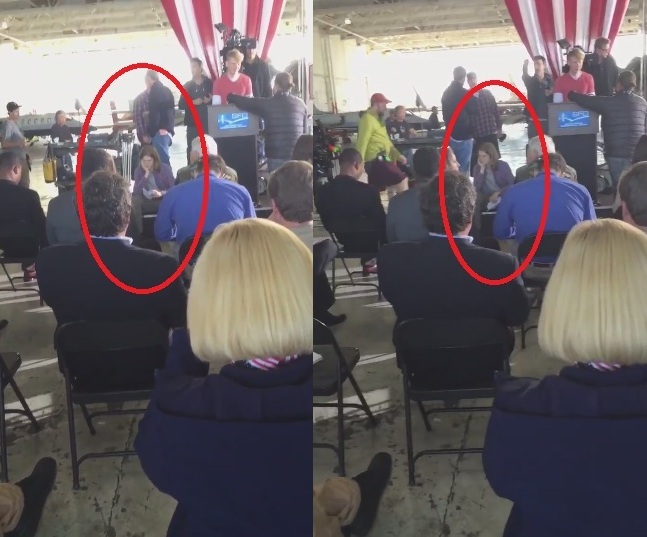 We never got to see a photo of Lucas on set while the filming process was still going on – although he had been in a short Twitter video uploaded by Hope Ayiyi, hiding in plain sight: While many assumed the guy at the podium was either Lucas or his look-alike-Stand-In, it turned out that Lucas had been sitting right next to it. 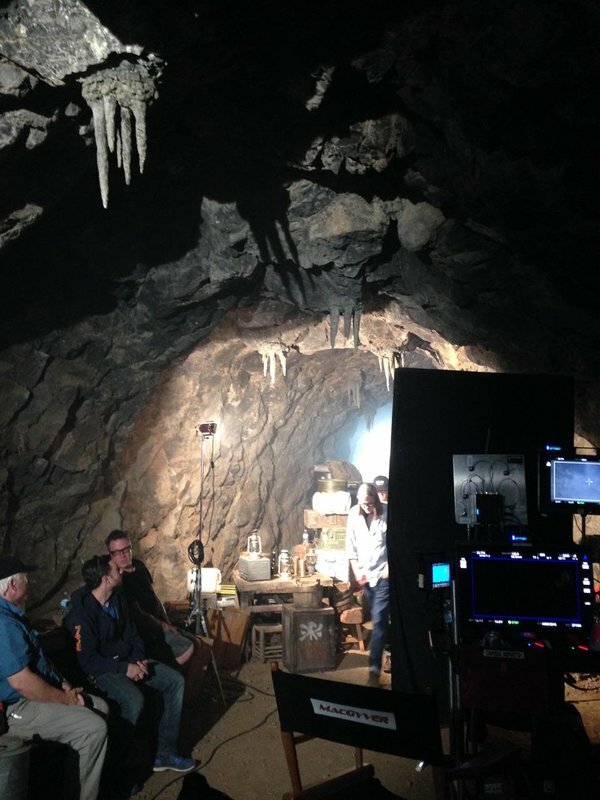 In a BtS photo (uploaded by Hope Ayiyi on the same day), you can see Lucas in character at the podium. This scene was also briefly featured in the Teaser Trailer. There had been some tweets on that day of Extras being cast as reporters, but they never provided any photos, holding up the no-photos-order for Pilot Season. Until a few weeks ago, I’ve never been able to find BtS photos of the other cast members in costume on set. We do have semi-official studio photos of the guys in costume, though – curtesy of Costume Designer Eileen Cox Baker and her website. 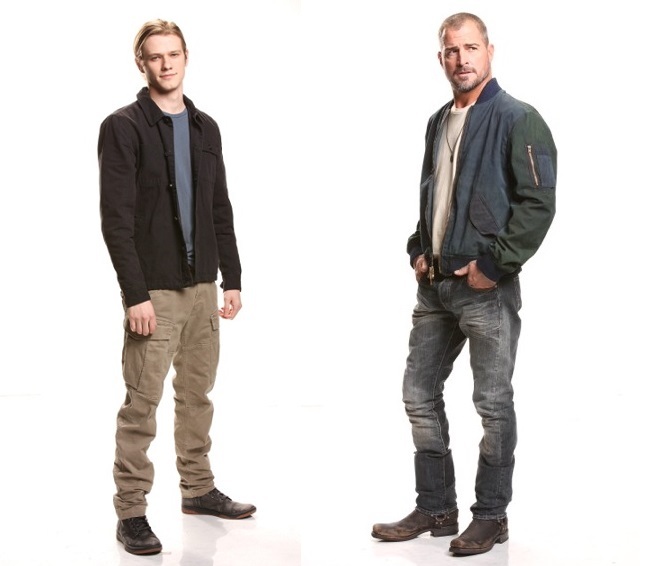 There’s both Lucas and George as MacGyver and Lincoln (before his character’s transformation into Jack Dalton in the rebooted Pilot), but also one of Joshua Boone as Mac’s friend and roommate Hunter (before the character’s transformation into Wilt Bozer). Interestingly, in both this studio photo and the official portrait used for promo at the LA screenings, Lucas Till keeps his long hair “hidden” in a ponytail, contrary to the Teaser Trailer and the Official Stills. Also, Unaired Pilot MacGyver’s costume and stance reminds Original fans of “Comic MacGyver”, a drawing of MacGyver that had been released by Lee David Zlotoff’s before the MacGyver Comics came out (and is still used as an icon on Zlotoff’s social media accounts). 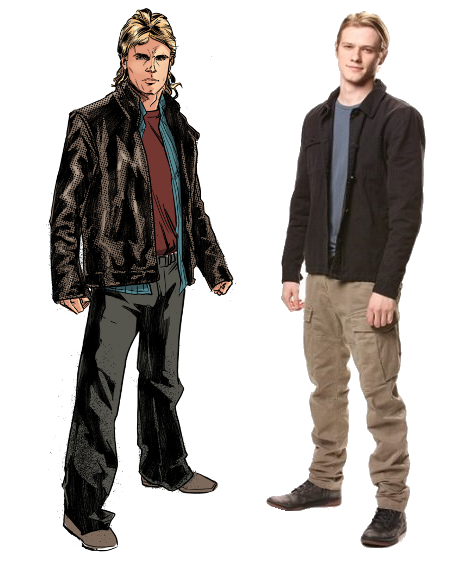 The drawing resembles RDA’s MacGyver, contrary to the drawings done for the comics. It is possible that the Costume Designer had taken some inspiration from this early version. Sadly, I couldn’t find anything about the costumes for the female characters. Either someone else took care of their costumes or Eileen Cox Baker didn’t put them up on her website. 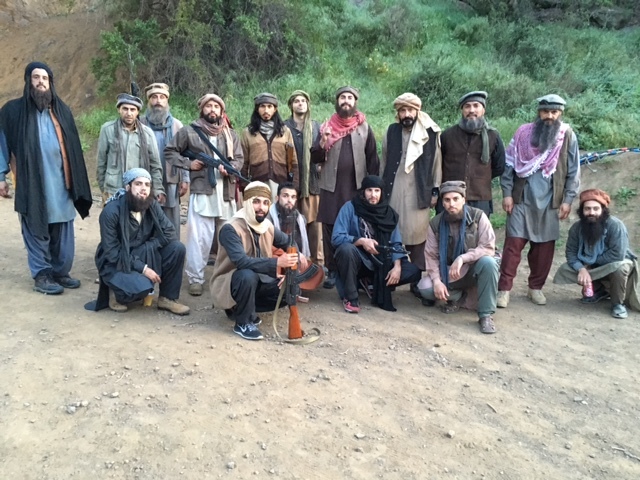 There is also a photo of the Rebels (or the Mazari, according to the storyline description by SpoilerTV) in costume. The clothes look good, but the beards are not very convincing. 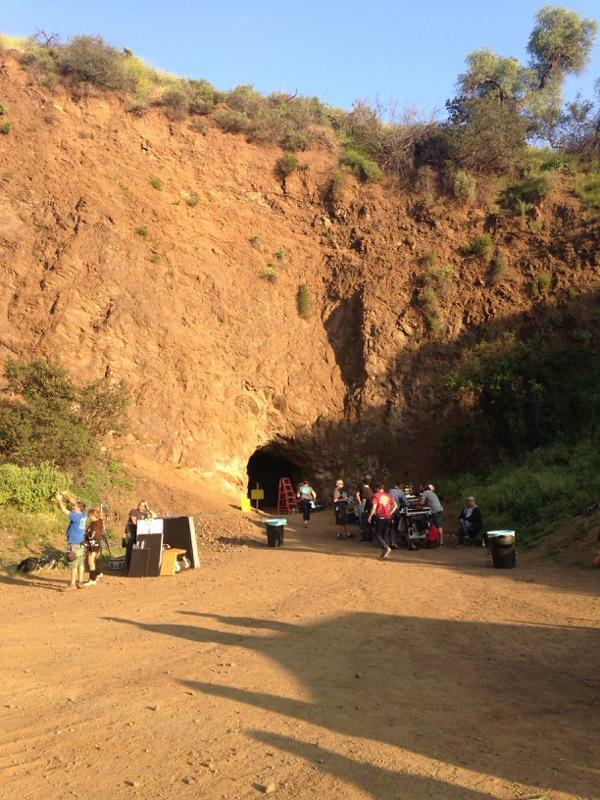 We’ve seen some BtS photos of the locations used for the Teaser Trailer that was released just before the Upfronts in May 2016. A few weeks ago – when picking up the research again for Unaired Pilot stuff – I finally stumbled over the first “official” set photos, curtesy of Production Designer John Mott. One is of MacGyver’s home, built on location. We can see Mac’s friend and roommate Hunter (Joshua Boone), MacGyver and Mickey (Addison Timlin), plus an unknown character on the left. 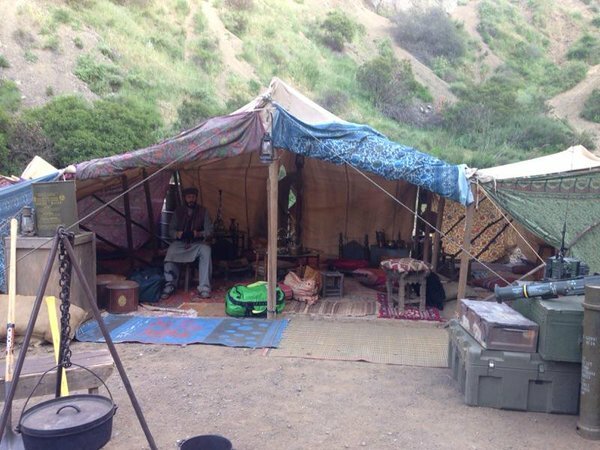 Interestingly, this home looks very different from the one used for the new pilot directed by James Wan (1×01: The Rising). MacGyver’s home used for the rebooted pilot is cluttered with stuff as well, but this one has more of an “antique” and old-fashioned feel to it; a bit like for Indiana Jones. It’s possible that MacGyver’s home had belonged to his father or grandfather. It doesn’t seem that plausible why MacGyver and Hunter (both in their mid-twenties) would live in such a place otherwise. 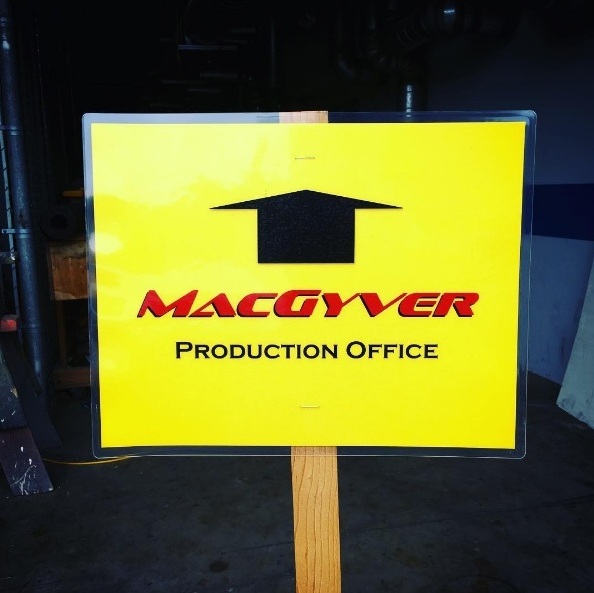 Meghan Lyvers had provided another photo of MacGyver’s home on Instagram back in April 2016. 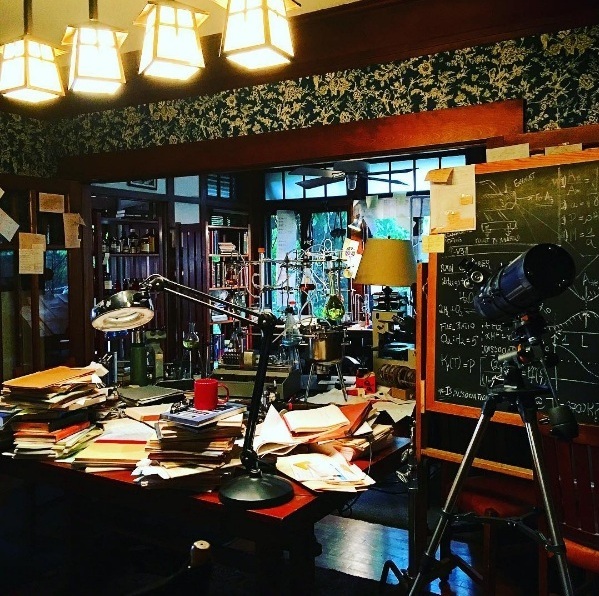 In the background, you can see the chemistry supplies that were also featured in one of the Official Stills. The other photo by John Mott is of MacGyver kept hostage in a secret lab. The container being held by the villain reminds me of the one used for the rebooted Pilot Episode. Judged by this photo and the parts of the storyboard I’ve seen, I’m assuming that there might have been a bio-weapon as well in the storyline for the Unaired Pilot. 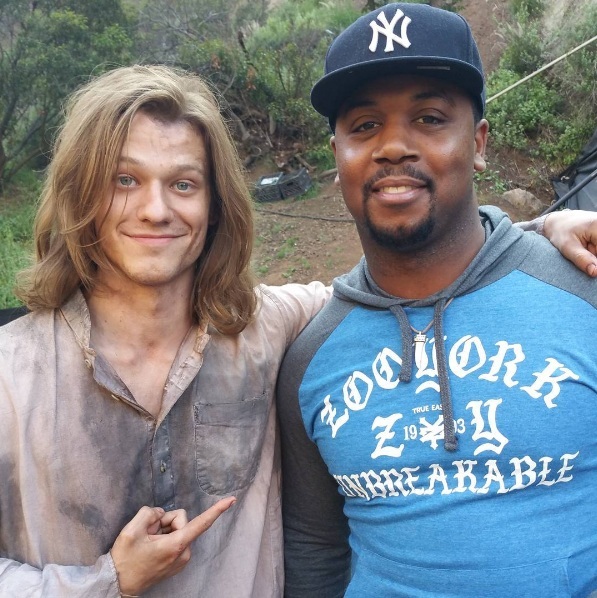 There’s only a handful of photos of Lucas Till on location, but let’s take a look at them. 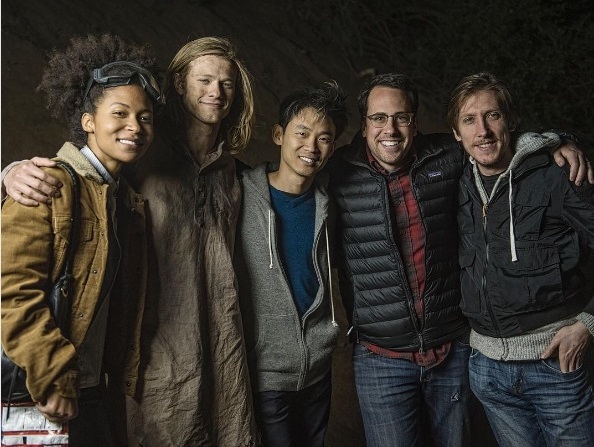 There’s one of Lucas with Executive Producer James Wan, Producer Michael Clear and other crew members during a night shoot; provided by Adam Michna. 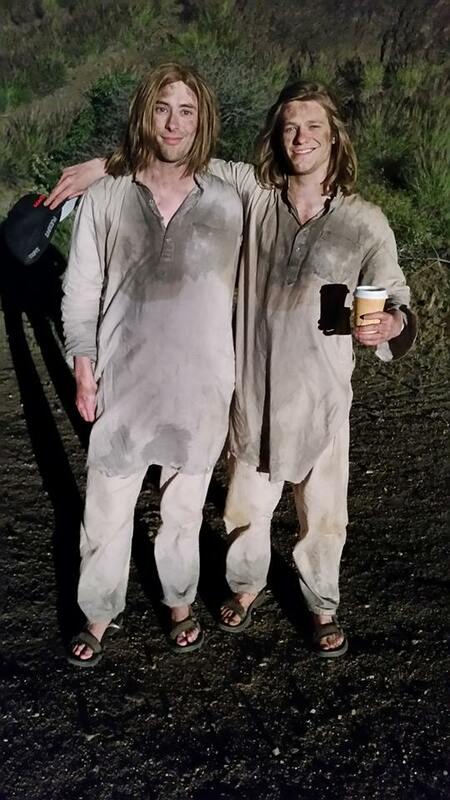 Another BtS photo shows Lucas with his Stunt Double Peter Wallack. This scene was part of the Teaser Trailer as well, when MacGyver escapes from the Mazari’s hiding place. For now, it looks that visual material of the Unaired Pilot is still kept under wraps. Let’s hope that people involved in this project will provide us with more photos and videos one day. Every time I dig through my stash of MacGyver-Reboot-related folders, I stumble over material about the Unaired MacGyver Reboot Pilot, filmed in Spring 2016. I have written about it before in various blog posts, but usually only a bit here and there. I’m trying to put all the necessary information together for interested readers – especially since many of you accidentally landed on my blog after looking for information about it by using search engines. If you missed Part 1 (about the Unaired Pilot’s Origins), you can read it here. If you want to read Part 2 (about the Unaired Pilot’s promo material), you can find it there. The Unaired Pilot was filmed in April and May 2016. Because of the lack of info due to the secrecy surrounding most pilot projects plus the misinformation about the filming initially happening in Portland, we had missed practically the whole filming process. Of course, it’s a lot more difficult to find more material when filming is already over. Also, in my naivety I never took a screenshot of the IMDb page; assuming it would stay up as it’s own project once filming is done (regardless if the pilot would be picked up as a series or not). Instead, they transferred the page; adding the rebooted pilot cast and crew while deleting others. This made it tricky to sort out who had been involved in the Unaired Pilot project and who hadn’t and to find related social media accounts to check for more material. The first few pictures were provided by “MJ London” and showed a variety of different locations. The photos disappeared pretty fast and even the Twitter account soon wasn’t valid anymore. It’s possible the photos had been uploaded by Meg London-Boche (personal assistant to director David Von Ancken), but I guess we’ll never know. The first photos provided us a look at the “bad guys” and at the new production logo – which was pretty well received by Original fans. The scene filmed in the shopping mall is prominently featured in the Teaser Trailer that was released at the CBS Upfronts in May 2016. 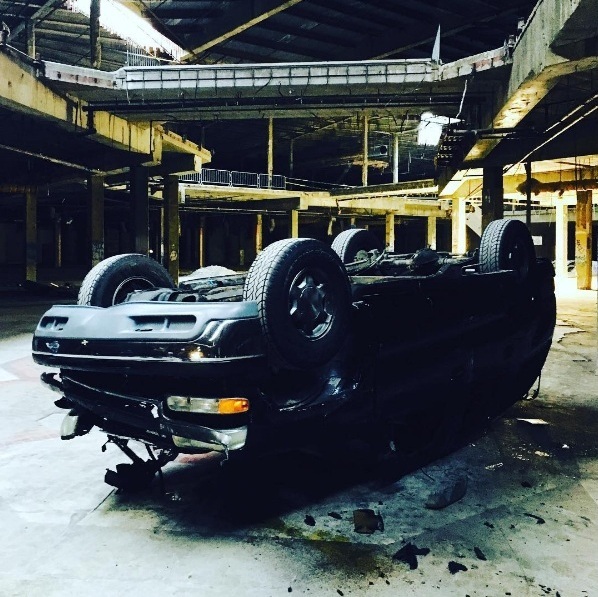 We later got more photos of the overturned car via Clint Buckner and Natty D.
Although Hawthorne Plaza is locked up for the public, there are hundreds of photos on social media; uploaded by people who like to visit “abandoned places”. Some people also illegaly shoot material for music videos or film themselves exploring the location (often on a skateboard). 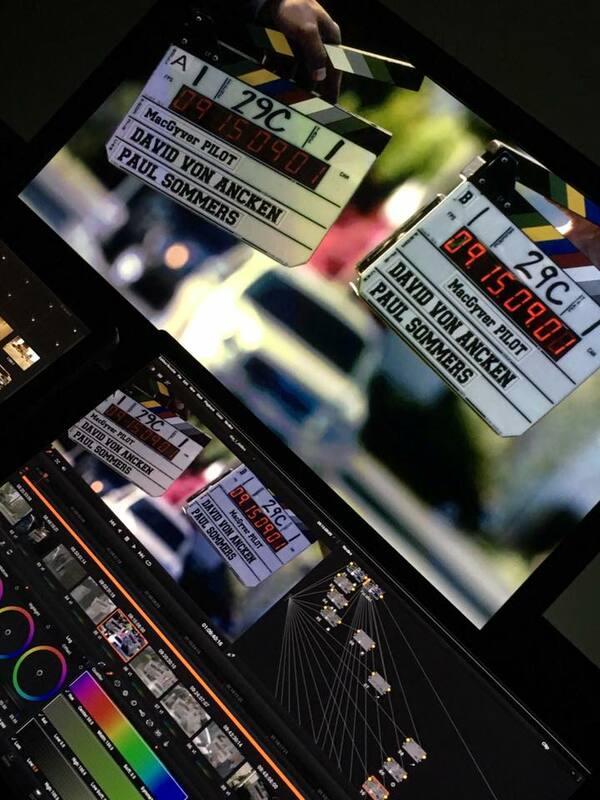 Some crew people provided photos while they were filming; e.g. hairstylist Kristine Tack (stating it was very dusty) or security guy Michael Alexander. 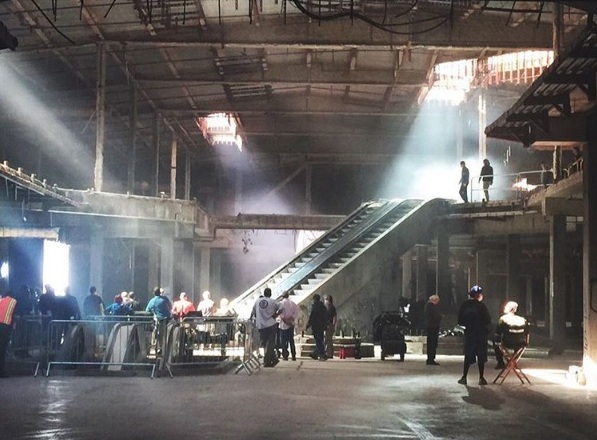 If you look closely at Kristine Tack’s BtS photo, you can see Lucas Till (or his stunt double) standing on top of the stairs. She also revealed that they had actually set off the sprinkler system during one of the explosions. Otherwise, I don’t know much about the locations used for filming. The only official location address provided was 2632 E. Washington Bl, Pasadena; adding the info that George Eads had been filming scenes there on April 8 (2016). The building residing there is the former St Luke’s Medical Center. Other shows and movies using this location include “Rush Hour 3”, “Kill Bill” or CBS shows like “CSI” and “Criminal Minds”. Another location used – found with the help of Google – was an empty office building on 5551 East Katella Blvd in Cypress (California). The building can be seen in the Unaired Pilot Teaser Trailer and also in one of the Official Stills. According to Jeremy Schonwald, it used to be a toy company’s headquarters and is mainly used as a filming location now. 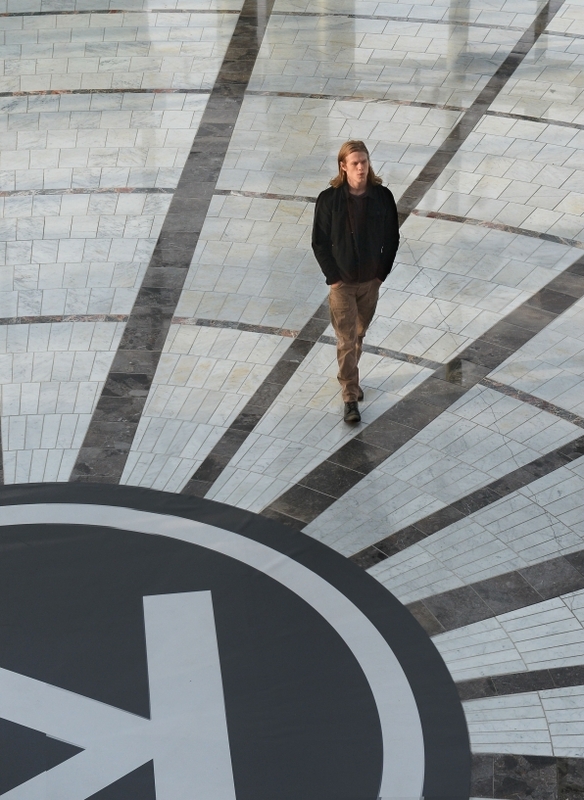 For the Unaired Pilot, they put a “K” onto the atrium floor, probably symbolizing the company’s logo (it stands for “Kresson”). If you’re interested in this location, you can find 171 pictures of the interior including offices and bathrooms (and find the contact address to rent the property) here. It was difficult to find anything on Pre- or Post-Production. We got a few production signs photos with the red logo on an almost neon yellow background. The shorthand direction signs spelled “MAC” (which was later changed to EYE for filming in Atlanta; probably because CBS uses an eye-sign for their logo). Kristine Tack revealed what they used as “bathroom humour” in the production office bathroom. 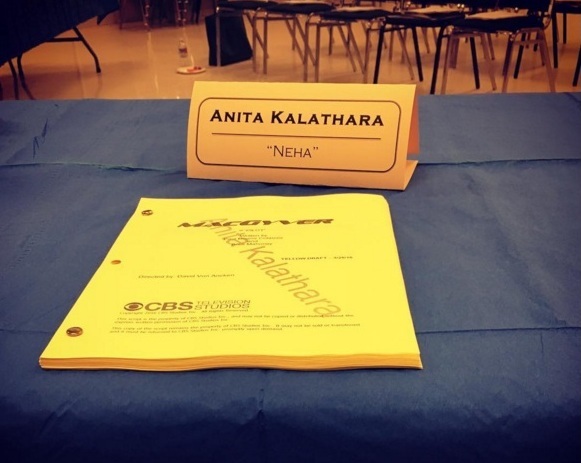 Cast member Anita Kalathara provided a look at the yellow revision script title page – sadly, we don’t know anything about her role as “Neha” and if she was MacGyver’s friend or foe. Contrary to the rebooted Pilot Script (The Rising) written by Peter Lenkov that is circulating around, the script for the Unaired Pilot seems to be a well-hidden treasure. 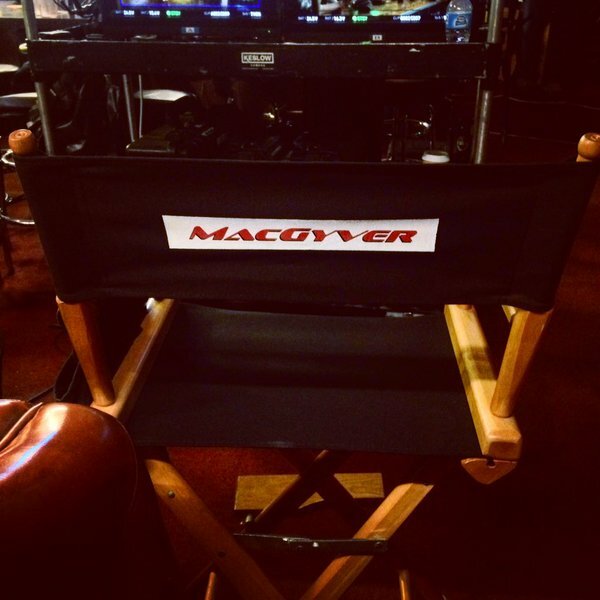 Every time I dig through my stash of MacGyver-Reboot-related folders, I stumble over material about the Unaired MacGyver Reboot Pilot, filmed in April/May 2016. I have written about it before, but it was usually a few bits and pieces here or there. I’m trying to put all the necessary information together for interested readers – especially since many of you accidentally landed on my blog after looking for information about it by using search engines. If you missed Part 1 (about the Unaired Pilot’s Origins), you can read it here. The Unaired Pilot was filmed in April/May 2016. Production wrapped on May 5, only two weeks before the CBS Upfronts – THE event for the networks to announce their TV schedule for Fall and to provide more info about the upcoming TV shows. On the 13th of May, Variety confirmed that the Reboot had been picked up and ordered to Series by CBS – with Peter Lenkov as an Executive Producer. The Hollywood Reporter hinted that the script might be tossed out and stated that the secondary cast members were “unlikely to return”. Deadline added that Lenkov would write a new script with the general premise of the series remaining the same; confirming that the supporting cast was not coming back. Of course, this was exciting, yet also concerning news. What had exactly happened, and was this project doomed now that they rearranged everyting, but still wanted the show to premiere in Fall? What would this mean for the quality of the show, if the showrunner had to not only find a new cast, but also a new crew and new locations in time to start filming in Summer? 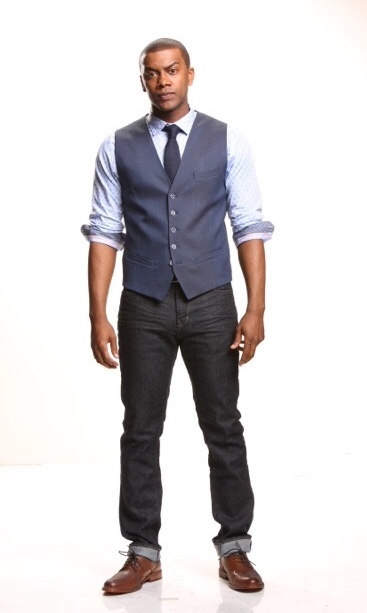 Why had CBS picked up the show for Fall if they didn’t like the pilot, the script or the cast in the first place? Did they care for MacGyver at all or only for the promise of making money with a well-known brand that had the potential to be turned into a franchise? And wasn’t Peter Lenkov already busy enough with Hawaii Five-0? The move also left a bit of a bitter taste since it looked like the secondary cast members got the news at the same time as us – via the internet. The reactions were mixed. 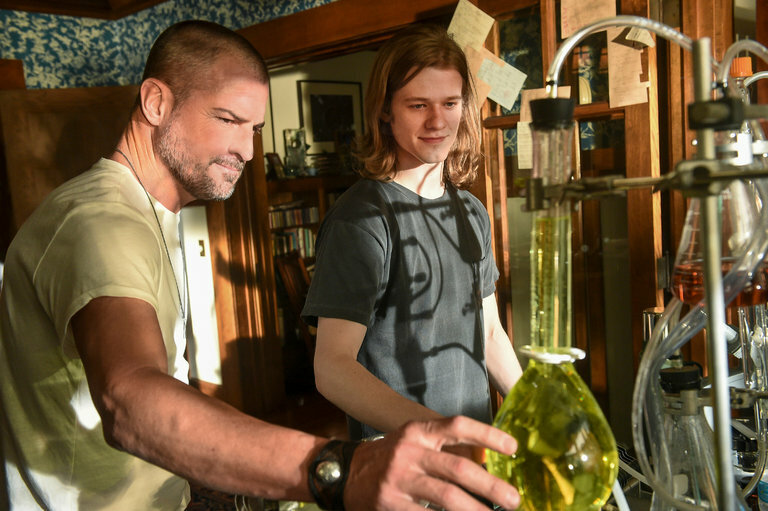 Many felt that MacGyver looked too young, but were quite happy to see that both chemistry and physics still seemed to be an important part of the show. Others made fun of rebooted MacGyver’s hairdo; deeming him as one of the “Hanson Brothers”. MacGyver 2016 has no time for haircuts! He’s gotta make a thing out of a thing! The logo – featuring an SAK forming the letter “v” in the show title – was very well received among the fans. Even 30 years after the original series, everyone associates the SAK with MacGyver, so the logo was pretty clever and easily recognizable. A secret agent unlike any other, MacGyver escapes perilous situations with nothing but a paperclip, his trusty Swiss Army knife and his wit. A dynamic reimagining of the hit television series, this action-packed origin story follows the young MacGyver as he returns from war, a hero with an idealistic vision of saving the world. He and his late father’s best friend partner to form the clandestine Phoenix Foundation. Using his scientific know-how and resourcefulness, MacGyver – alongside his intrepid team – undertakes missions to save lives and change the world. CBS also revealed that the show was scheduled to air on Fridays, which had some fans worried since Friday used to be a “death slot” for years until CBS had managed to turn it around for them. At the Upfront Events, usually both Art Work and Teaser Trailers for the new Fall shows are being released. This not only to tease the potential audience, but also to attract international buyers. Since we already knew that the Pilot Episode would be scrapped along with most of the cast, we were wondering if CBS would even dare to show a trailer. The trailer soon hit social media accounts all around the world. To watch it, the fans had to do a bit of MacGyvering themselves since the trailer was geo-blocked outside the USA. It didn’t take long for other countries to post and revierw it as well, though. Let’s just say it wasn’t that well received – or the positive reviews got buried under the amount of negative comments and down-votes. Many Original fans found rebooted MacGyver too cocky or too violent and not very distinguishable from any other action show. And of course, the comments about his hair were never-ending. Some of the fired cast members (e.g. Addison Timlin) were not happy either; tweeting statements like “I wish network television would quit firing me but putting me in their promotions anyway”. 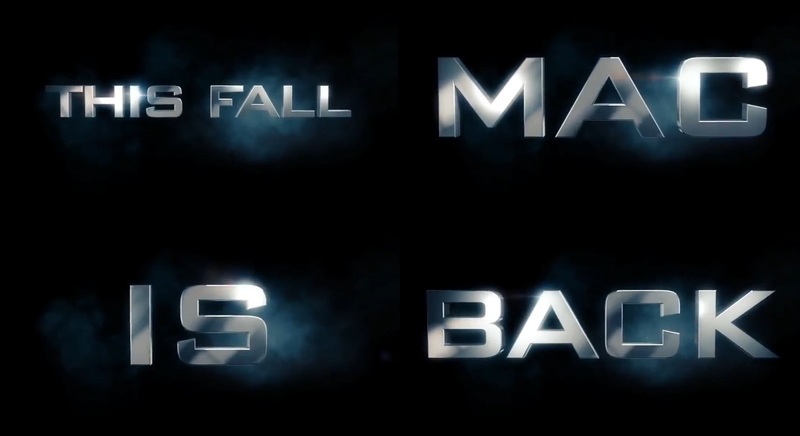 In the Teaser Trailer, they created the tagline that they would later use for the rebooted Pilot Episode again: Mac is Back. 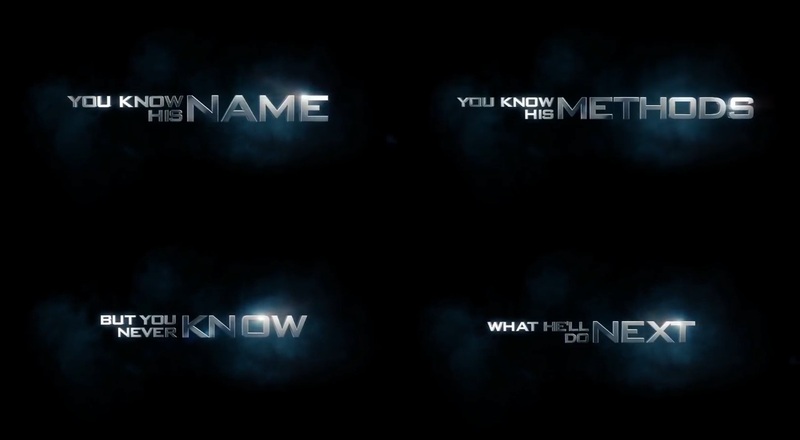 The trailer clearly marked the show as a one-man-show like the Original, with MacGyver as the lead hero in the centre. According to Deadline, a 20-minute-cut-down of the pilot episode had sparked a lot of interest among international buyers. Nonetheless, CBS declared the trailer soon to “promo non grata” and erased all their former tweets, posts and Official Stills concerning promo for the discarded pilot from their social media accounts. A few days later, Peter Lenkov posted a photo on Instagram that showed a promo poster in form of a character portrait with Lucas Till. 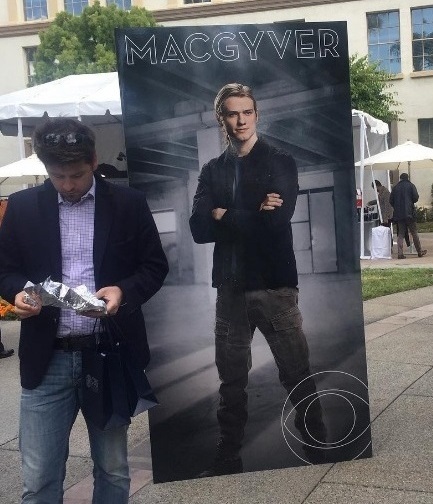 Interestingly, they used yet another font for what seemed like the new MacGyver logo, but the writing style was used for posters for other CBS shows as well. Since Lenkov was on holiday, he didn’t attend the event and neither did the (remaining) cast members. Usually, there are cast photos and interviews being made at the LA TV Screenings, but with the imminent rebooting of the reboot, we didn’t get to enjoy any of that.